One Stop Fashion's is proud to announce on 3/31/2011 will mark our one year anniversary! We want to thank everyone for your love and support, because of you we were able to grow to where we are now. We still have a long way to go but we made it this far. 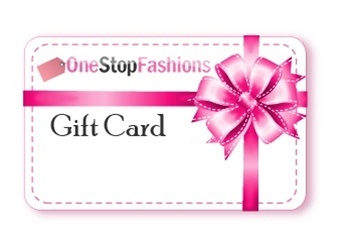 We are giving away a $50.00 gift card good in our store! You can enter one time per person we will use random.org to determine the lucky winner! We will run the contest from March 1st and announce the winner on March 31st 2011. Good luck everyone! Follow us on Face-book and Twitter to stay updated on this giveaway and many more to come. (1). 1 entry per person/comment on our blog-spot with your first name and email. USA and Canada entries only. (2). Follow us on 2 of our four social networks. Face-book, twitter, blog-spot, and you-tube. (3). The winner must send us a photo and testimonial. So we can add it to our review section on our website. The winner can also do a review live if they have a you-tube account. (4). Tell us where you found out about our giveaway. Great giveaway! Thanks!! FB follower Sharon Siqueiros. I'D LOVE TO WIN IT. I really like the Over Sized Red Satchel Handbag. I follow your blogspot and Youtube! And I found the giveaway on the Two Classy Chicks blog! Keep Growing... congrats on your hard work paying off!